Editorials from Theslowlane: Is God Hiding in the Dark Matter or the Dimensions of String Theory? Is God Hiding in the Dark Matter or the Dimensions of String Theory? Our perception of the universe keeps getting larger and larger. In ancient times, it seemed like Earth was "center of it all" and not even all of Earth was known about. The Romans had no idea that the Americas existed. There were also many things, like thunder, that were unexplained. They were attributed to the gods. As our knowledge grew, we started explaining things in more mundane terms. We could make statements like, "thunder is not angry gods, but more explainable events in the atmosphere." Science has a tendency to demystify things. It tends to push the idea that "something is caused by a god" farther from the picture as understanding advances. Does that mean science can explain God totally out of the picture? Not really, at least in my opinion. While scientific understanding tends to explain God out of our little world, it also tends to expand our world. As the known world grows, the unknown world grows also. The unknown world may even be growing faster than the known world. The universe that we try and comprehend is much larger today than the Romans would have imagined. Not only is Earth larger than the Romans thought, it's also just a tiny speck in something even bigger. Billions and billions of stars, planets and galaxies, as Carl Sagan would have said. There's still plenty of room for mystery. Plenty of room for God, or even gods, to hide in. Just in case you thought the billions of stars and galaxies aren't enough mystery, I read that possibly 95 percent of the stuff in our universe is totally invisible to us. It's the so called "dark matter" and "dark energy." What is dark matter and / or dark energy? We don't see the light from it, but many astronomers think it's got to be there because they see the effects of its gravity on the stuff that we do see. Dark energy seems to be repelling the galaxies apart at an ever increasing rate while dark matter is arranging and tugging the galaxies around in various ways. It's like invisible hands pushing and pulling things around, but we don't see what's doing this. For now, we can leave dark matter and dark energy in the pile of unknown. That's the pile where we toss God also. Even without that 95 percent of the universe people call the dark stuff, there's still a lot of the visible universe that's mysterious. Billions and billions of galaxies and lots of unexplained stuff. Even unexplained stuff right here on earth. Unexplained stuff in our ecosystems, brains, what ever. As soon as we pull some new understanding out of the pile, we find that pile of "unknown" just gets even larger. We never seem to explain God into a corner or out of existence. The universe is far too large for that. If our world was as small as the Romans must have perceived it to be, we would be well on our way to explaining away God. We would have explained thunder, much of weather, the flowing of streams, the chemical reactions that cause fire, evolutionary theory leading to the variety of species and so forth. Basically, we would eventually run out of mystery. 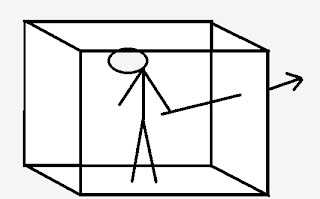 Still thinking inside the box of the Romans, God's corner is getting quite small. As it is, we are no where near running out of mystery as our perception of the size of the universe just keeps growing along with our understanding of certain things around us. Falling off the edge yet? 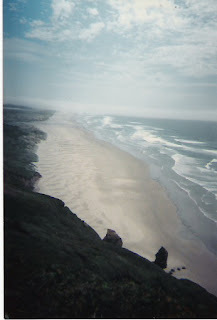 Image from one of my bicycle trips down the Oregon coast. "The more we know, the more we know that we don't know." There is still plenty of "place," on this huge stage we call reality, for God. More place all the time as the pile of unknown seems to grow faster than the pile of known. It's like we're loosing ground. It's also kind of like we are getting more humble all the time. In many ways, we seem to be less arrogant than the ancients who thought that man (for the most part not even women included) was the center of the universe. Here's an analogy that I thought about this while I was mopping the floor. My custodial job gives me time for contemplation. Ancient man sat in a room of darkness. He kept hearing a rustling sound that he thought was a mouse in the room. "Mouse" means "God" for the terms of this analogy. He kept hearing the rustling, but couldn't see anything due to the darkness. He thought, "it's got to be a mouse till he turned on a light." "So, the mouse must be around the corner, behind the dresser, under the bed?" He turns on more lights. He lights up a bigger area. He sees under the bed. No mouse. Behind the dresser, no mouse. Soon the entire room is lit up. No mouse can be seen and he realizes that the rustling is coming from a window shade. Yes, there's a window shade. It's making a rattling sound in the wind. Seeing the window for the first time is when ancient man first gains the concept that there is such a thing as an "outdoors." In the dark room, he thought the little room was all of reality. Now he sees more. "There's such a thing as an outdoors!" Now there's more room for mystery to lurk. He can now ask questions like, "where does the wind come from?" Yes, science tends to demystify a lot of things, but at the same time, it keeps pushing the frontiers of knowledge out into much larger worlds. Bigger worlds where mystery still abounds. As the world of unknown keeps growing, I also read about many scientists describe the world that we do know in poetic and even artistic terms. Sort of like, "even the world that we do know is not really that totally mechanical either." It can be described more like a work of art than just the grinding of some impersonal machine, at least according to many scientists who I read about. That's another whole tangent of thinking and it's quite fascinating. It seems to me like we may have all but "proven out of existence" the god of the small world that fundamentalist religion was born out of. That god, who is said to have "created the Earth in 6 days." Now days, he seems to be just about folk tale. That's the god who's "6 day creation special" defies geological findings. A little while ago, I heard that, "on the 7th day, God ordered pizza." It's believable, especially when the priest owns stock in a pizza delivery company. The true universe is much larger and more mystical than folks living in that small world of Biblical times even imagined. Maybe they had some useful insights that we can still benefit from today, but the world is much larger and even more mysterious than that. Now, as if that unseen 95 percent of our universe, we call dark matter and dark energy, isn't enough, there is String Theory. Folks working on "String Theory" could be opening yet another "picture window" on the great unknown. 10, or maybe even 11 dimensions! More dimensions than just the familiar "up / down," "this side, that side" of a cube. We can picture 3 dimensions. We can even (almost) picture the fourth dimension. That's the dimension which "relativity folks" describe as being "Time." We have 3 spacial dimensions and a 4th dimension we call time. Einstein talked about "Space Time." Hard to imagine, but I can almost wrap my brain around it. Well not really. String theorists even talk about something called "Brains." Yes, brains, like in our heads? Or maybe more like membranes? No, I don't really know what the concept of "brains" means either. So, what about the 4, or even 5 additional dimensions? It's dimensions beyond our current conceptions. Yes, String Theory seems to explain a lot of things in this universe that are now, you guessed it, mysteries. String Theory is supposed to unify the world of "Quantum Physics" to the world of "Relativistic Physics." Don't ask me why. I just know that for String Theory to work, "they" say it has to have 10 or 11 dimensions. 10 or 11 dimensions. Wow. All these dimensions have to be there because some physicists say so. A lot of physicists. Theoretical physicists with mathematical equations that look like gobble-de-gook to me. Well, I take their word for it. That's all I can say. I got a "D" in basic algebra. So far, String Theory, or even dark energy and dark matter have not been totally proven. It's just that a lot of scientists think we are really on to something. On to something rather profound in explaining more of this universe. We just keep asking more and more questions. Our world keeps getting larger and larger and there always seems to be plenty of room for something folks can call a god. I guess one can say, "it can truly be seen as an artistic, fantastic and mysterious world out there." that each one of us is a sort of collection of little pieces that are themselves sort of like separate "organisms," and addiction is when those pieces get attached to certain things. Here's another point that is related to what you said. would that be possible? Are they right about that? stars as we observed them. I think the only way you'd observe a black hole is to be pulled into it! Now that I think of it, even the claim to have seen those planets is somewhat in the same category. Someone might say the break in light is caused by something else. Maybe dark matter! Whether we can observe a black hole, or not, depends on how one defines "observing." Yes, I think you are right, we don't really see the black hole itself. We just see evidence of it. In the past, maybe black holes were more in theory, but now we see more and more evidence. I guess, from outside that "event horizon" one cannot see anything inside the event horizon. it comes out here." Wonder if that was about the record, or the French horn? information closer to what they say would be the event horizon. dark matter. That's an interesting idea. In college astronomy, they said we have not yet even resolved the disk of another star, besides the sun. it's amazing what they can infer. than a suite case. I think it's really called MOST. This mystery of the Universe is why I stick to Pandeism, because Pandeism sensibly explains that God simply set out the basic physics to create the Universe. So, says Pandeism, all the planets and stars and galaxies, black holes, dark matter, all of that was just the result of using the right mix of physics at the outset to create a Universe in which life would be most likely to pop up eventually in some of those many star systems. There's a video I've seen, I'm sure you can find it easily on the web, shows the results when the Hubble focused for a few days on a patch of sky that looks completely empty from Earth - and found tens of thousands of galaxies in that seeming barren patch! So, yeah, there's a lot out there that we don't know, but at least the Universe is suited to allow us to come into existence, so here we are to think about it all.